I have a ton of USB devices and I’m am constantly running out of ports. I hate having to unplug one device to plug in another (much like Norm Abram has multiple routers so he doesn’t have to change the bits), but with only four ports on my Mac Pro and five on an external hub, that’s what I’ve been reduced to. I’ve seriously gotten into Twitter, so much so that I’m using it from my shiny iPhone. Yesterday I noticed an announcement from David Sifry about his new service called Hoosgot. It’s the “return of the LazyWeb” whereby you can toss a question over the wall to Hoosgot, it will automatically pick it up and send it out “into the ether” where someone might know the answer might see the question and might answer it. I decided to give it a try. I use Blosxom as my blog engine. I’ve used it since January 3, 2003, so I’ve got quite a time-investment in it. About two weeks ago I was trying to improve my Google-mojo when I noticed that all my story links that Google knew about all had the same title, “Joey Gibson’s Blog.” That’s fine if you are on the front page, but each story has a title that should be indexed with it. I set about figuring out how to get the story title to show up in the browser titlebar (which is essentially how Google titles articles when it indexes them), but after a few hours of trying to remember long-forgotten Perl, I failed. So yesterday when I saw the Hoosgot announcement, I gave it a shot. Within two minutes of posting a tweet directed to @hoosgot, I had a private tweet from Gavin Carr telling me the Blosxom plugin I needed. Within five minutes of that, I had my problem solved. That, my friends, is very cool, indeed. Hoosgot looks like something that could be very cool. For those interested, the answer was to use the storytitle plugin. What’s also interesting about this is that Gavin told me he is a “happy user” of a Blosxom plugin that I wrote a few years ago called reading_room. I was watching TV this morning, it being the first day of my end-of-year vacation, and noticed that “The Price is Right” was on. Since I hadn’t seen it since Drew Carey took over as host, I decided to watch. After a while, they went to commercial, and I saw a spot for a book by Franklin Graham called The Name that really annoyed me. It’s sort of hard to see, but what they have is Ιησούςν which is incorrect in a few ways. First, the iota Ι at the beginning of the word should have a smooth breathing mark, thus making it look like this Ἰ. Strictly speaking if you write the Greek without accents, then you would also not have the breathing mark, but since they do include the accent over the upsilon, they should have included it. That accent is the next error. It should have been an upsilon with a circumflex ῦ instead of with an acute accent ύ. The next two errors are at the end of the word where you see a sigma followed by a nu, ςν. In Greek the sigma has two forms: σ for when it occurs inside a word, and ς when it occurs at the end of a word. Since they have the sigma here as the next-to-last letter, it should have been written σ. But Jesus name is not spelled this way in Greek. In the nominative case (as a subject), which is what it should have been based on how it was being used, it is written Ἰησοῦς. In the accusative case (as a direct object), it would be written Ἰησοῦν. It looks like the people who made the ad combined the two forms, resulting in a nonsense word: Ιησούςν. Would it have killed them to get someone to proof their text before sending it out? Granted, 99% of the people who see the ad won’t know the difference; I wouldn’t have 2 years ago. To me, it just shows sloppy work. I have to wonder how many of the other names were misspelled. Plus the whole ad looked like it was hawking one of those awful “Left Behind” books. Are My Local Krogers Blocking EDGE Data? Since getting my iPhone, I’ve visited two Kroger stores near my house and in both stores I was unable to access the Internet over the EDGE network. In both stores I had 5 bars of signal, and in both stores I was able to place calls, so it wasn’t a signal problem. But in both stores, trying to access any website using Safari failed with a message about not being able to find the server. Now, in both stores the iPhone popped up its list of available WiFi networks and in both stores that list contained a single network called “nomad5.” In both cases the network was private, so I didn’t try to connect. Am I seeing something nefarious where there is nothing? Is it just coincidence that in both of these Kroger stores I was unable to get on the EDGE network, despite the fact that I had a perfect signal? Is there some technical aspect that I don’t understand? I’d love an answer to this. There is a third Kroger that is about 5 minutes from my house, so I will try to get to it and run a test to see what happens there. I had my best score ever tonight. A 248! 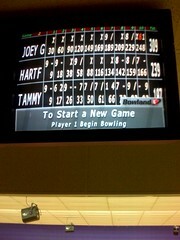 My first game was a 141, and my third game was a depressing 124. I was looking through the new jobs that had been posted at my company’s site, and I ran across this one. Check out the last line of the job description. I don’t think that’s really what they meant to say.